Admit it, when you were a kid, every time you launched a paper airplane you imagined what it would be like to actually pilot it. It’s been quite a few years since you were a kid, though, and it turns out the technology to realize such a fantasy finally exists. PowerUp Toys first revolutionized the paper airplane as we know it by creating a lightweight upgrade kit that added a motor and rudder to the craft, essentially turning it into an RC toy that could be piloted from a smartphone app. But technology marches on, electronics get smaller, and now PowerUp Toys has found a way to put a tiny live streaming camera on a paper airplane you fold yourself. The PowerUp FPV swaps the pivoting rudder of the PowerUp 3.0 for a pair of independently-controlled propellers that are used to steer the craft left and right, and even gain altitude with quick bursts of power. But the most interesting upgrade here is a tiny video camera on top of the carbon fiber reinforced frame that can swivel a full 360-degrees. PowerUp Toys actually worked with Parrot, known for its line of remote control drones, to help realize the best feature of the new FPV: live wifi video streaming to your smartphone at a full 30 frames per second. The wide-angle camera can record footage of your flight to a microSD card inside, but the real fun comes when you put your smartphone in a VR viewer like Google Cardboard and get a first-person view of the paper airplane while it’s in flight—from up to 300 feet away. The only thing better than annoying your co-workers by sending paper airplanes crashing into them is being able to see the reactions on their faces just before impact—and that’s what the FPV allows you to do. 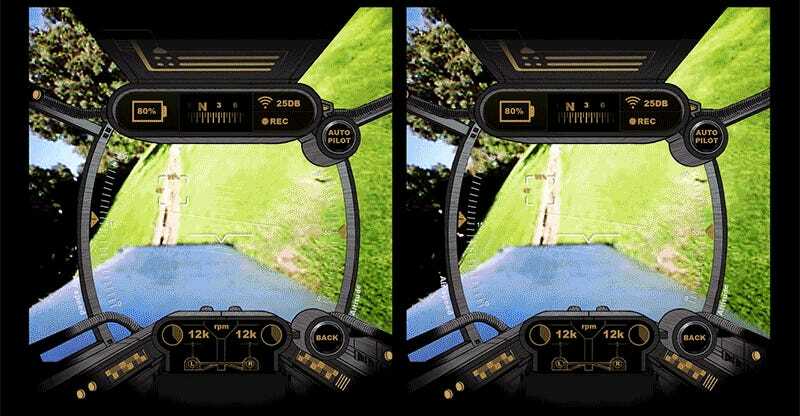 Your upgraded paper airplane can be precisely piloted towards your target using on-screen controls on a connected smartphone, or steered using a heads-up display while you’ve got your touchscreen strapped to your face. Battery life is expected to be around ten minutes of flight time per charge, but you can probably eek out a little more time in the air if you’re not streaming video, and not pushing your plane to a max speed of up to 20 miles per hour. But where’s the fun in that?